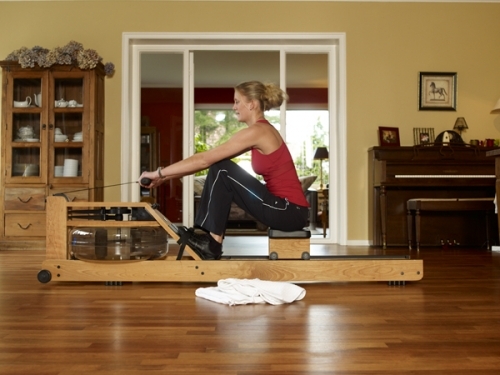 WaterRower is made in the USA using hardwood from only replenishable sources. WaterRower strives to manufacture rowing machines that are of a stylish design and built to last, while maintaining our commitment to eco-friendliness. Our WaterRower Rowing Machines are functional fitness furniture, designed not to be hidden away like other unsightly gym equipment, but to look at home in your living room. Storing the waterrower in an upright position no wider than a dining room chair, our rowing machines can be easily laid out for a quick indoor rowing exercise session. Rowing has gone from being a competitive outdoor sport to one of the growing new trends in group exercise. Indoor rowing is the perfect exercise for people of all body types and fitness levels, from beginners to professional athletes. Don't Miss The Boat!! Go to FitnessZone.com to order your WaterRower today and start your adventure to a stronger body and a healthier life. Call 1-800-875-9145 and let one of our fitness advisors help you with your selection of our WaterRowers that will best meet your needs. 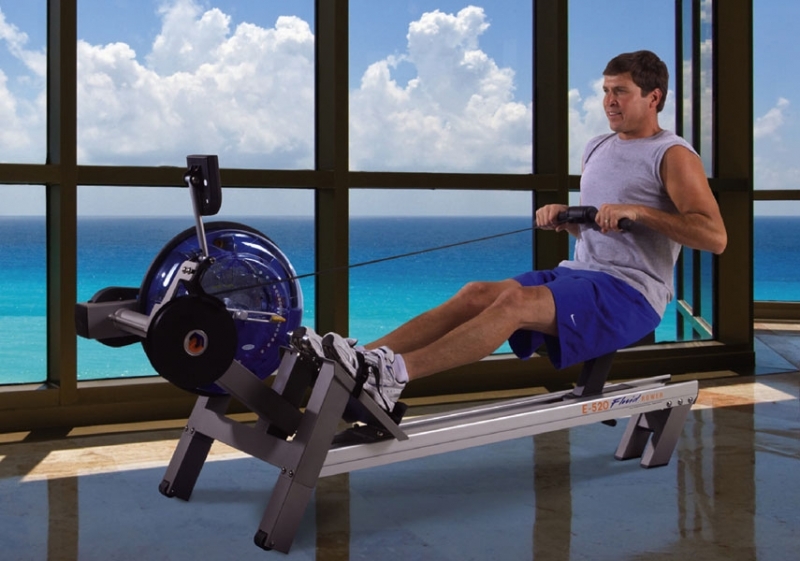 Rowing machines are a total body builder because they provide the best total-body workout of any cardio machine. this is because they require equal effort from both your lower and your upper body, which will lead to greater gains in overall cardiovascular fitness. What better investment can you make for your health? Rowing is the perfect activity to keep in shape, lose weight, cross-train for another sport, compete, or recover from an injury or surgery. Anyone can row at any age despite specific physical challenges because rowing is a low-impact activity. 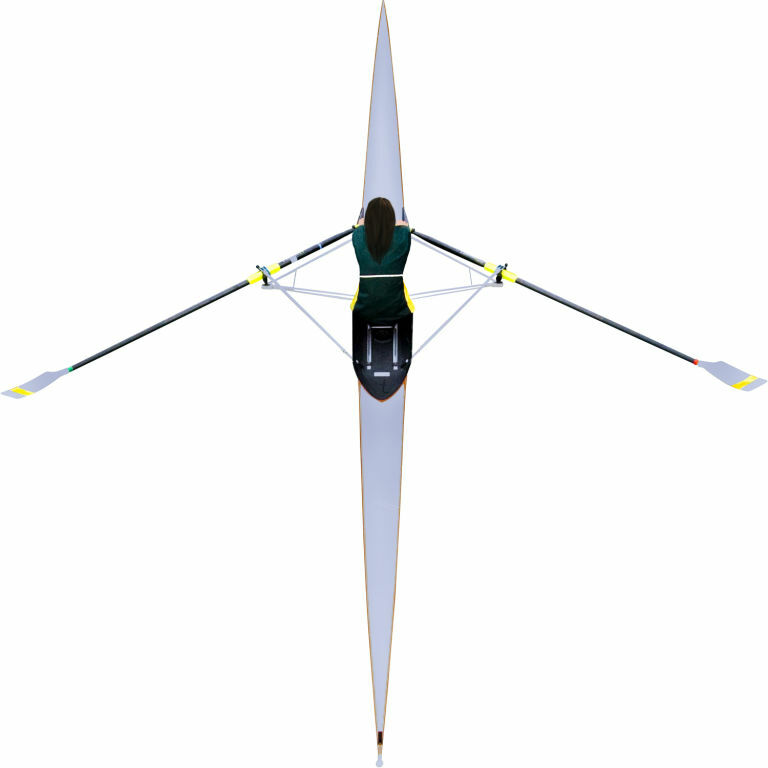 A study has shown that “Competitive rowers expended almost twice the number of calories on a 2,000-meter course as a runner in a 3,000-meter steeplechase.”1 However, since rowing is low impact, you will not experience the same wear and tear on your body that you would if you were a runner. Plus, you build strength in your upper body and core. Your body core, or trunk, becomes stronger and better prepared for those unexpected moments by helping you avoid a fall or help keep you from hurting your back when lifting a child or a heavy box awkwardly. Add up all the benefits and it's no wonder more and more people are stepping off the stationary bike and strapping into a rower. "People are catching on that they could be getting so much more out of their workout in the same amount of time. "Rowing is the ultimate, non-jarring, full-body exercise. One can choose to maintain a steady, relaxed pace or rowing can be one of the most intensely competivive endurance sports, burning as much as 1200 calories an hour. Rowing is the perfect exercise and is the best simulation of that perfect exercise. Calories are burned in relation to the number of muscles used and the intensity and duration of the exercise. Rowing with a sliding seat uses a very large muscle mass since the upper, lower and trunk muscles are used vigorously"
The WaterRower Natural Ash Rower is unsurpassed in terms of design refinement. 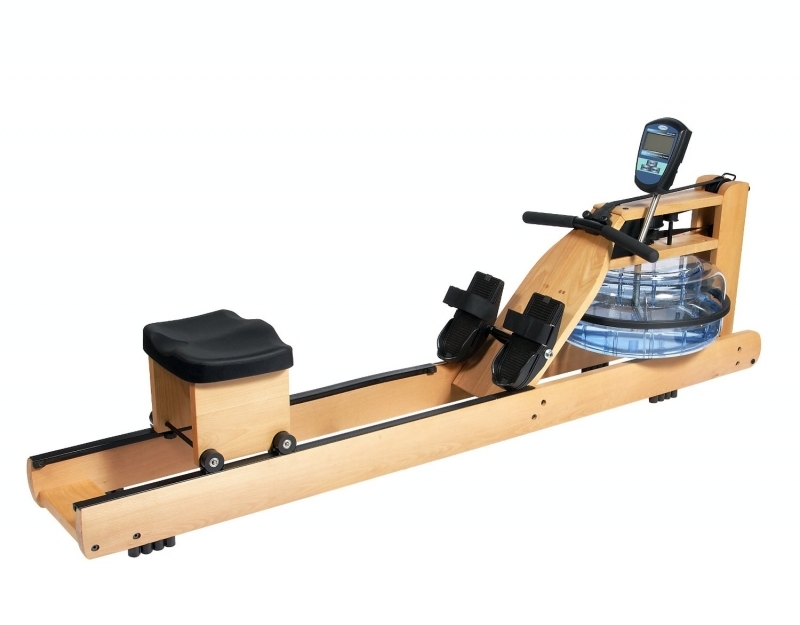 WaterRower Natural Ash Rower has a patented Water Flywheel design emulates rowing like no machine before it. Smooth, silent and storing conveniently upright the WaterRower Natural Ash Rower is perfect for any user and in any environment. The WaterRower Natural Ash Rower has an unique patented WaterFlywheel has been designed to emulate the dynamics of a boat moving through water. No other exercise equipment burns tones, and works the body as effectively as the WaterRower Natural Rowing Machine in Ash Wood with S4 Monitor. Rowing, like other endurance based aerobic activities such as swimming and cycling, has long been recognized as the most complete aerobic exercise. It is a non-impact workout and is naturally smooth and flowing. With the Ash S4 WaterRower, you work 84% of your entire mucle mass – more than any other exercise. Because the WaterRower Natural Ash Rower has a patented Water Flywheel it uses the same physical dynamics as rowing, its operation is equally as peaceful. Simply pull the handle and you are greeted with the sound of surging water. The noise, while not silent, is soothing to the ears and is far from intrusive on the WaterRower Natural Ash Rower. The First Degree E-520 Fluid Rower is the epitome of all indoor rowers, bar none. 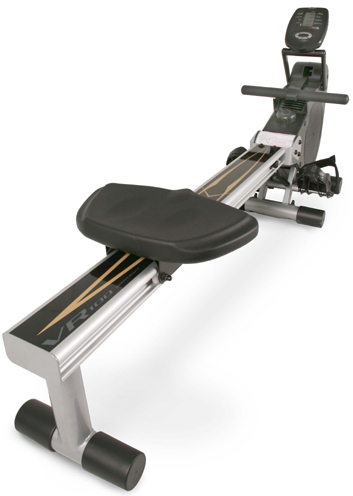 It represents the highest quality indoor rowing experience and is the top of an already hard to beat line of fluid rowers from First Degree Fitness. It offers an industry-best on-water rowing emulation with a natural catch and resistance through the stroke along with unmatched durability and an unprecedented 20 levels of patented variable resistance. Many clubs or wellness center’s use it as their key go to equipment when trying to demonstrate innovation in fitness or a real sensitivity to user needs. 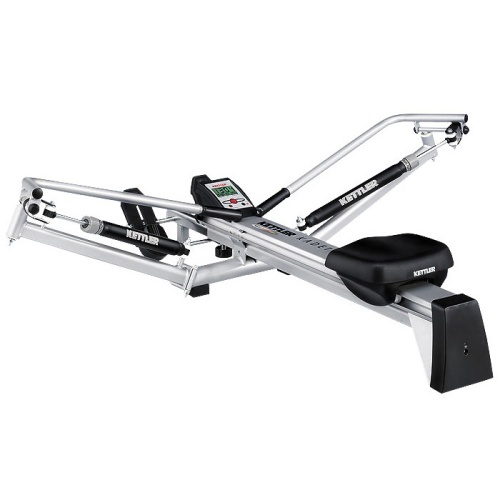 The First Degree Fitness E520 Fluid Rower is a great product! • Innovative Hydro-Power Resistance System provides an incredibly smooth and relaxing "on the water" rowing experience that feels and sounds just like the real thing. • Quick adjustable "pivoting footrest" with a large solid "sure-grip" footpad. • Large oversized Ease-To-Read display panel that shows: Exercise Time, Distance, 500M Split Time, Strokes/Min, Calories and Heart Rate. Includes a built-in heart rate receiver. 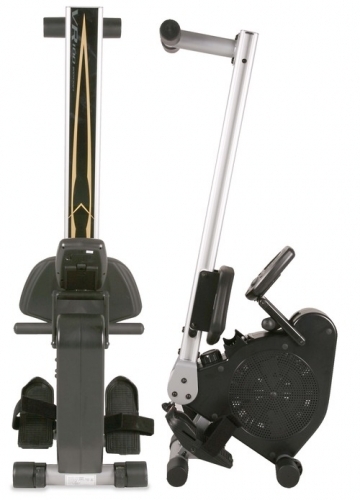 • Dual aluminum seat rails to support a maximum user weight, 55 lbs (230 kgs). 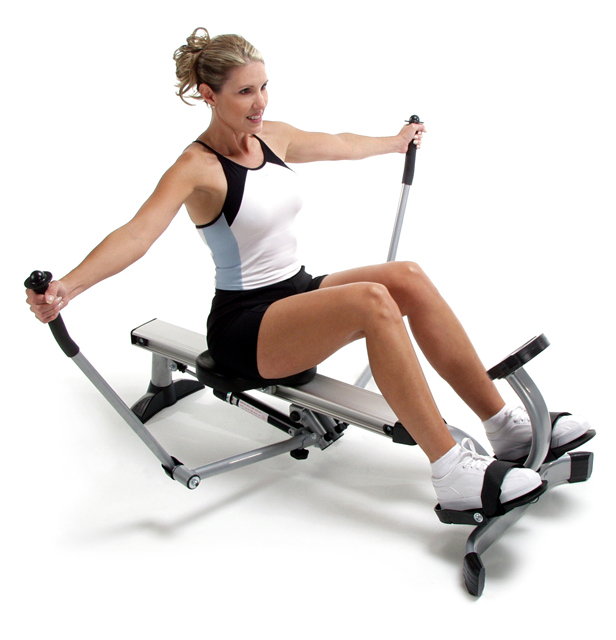 The Stamina Body Trac Glider 1050 Rowing Machine is a must for people who love to exercise and keep fit. This exercise equipment is compact in size, making it ideal for fitness lovers who prefer to exercise at home. It can tone your muscles and stimulate your blood circulation. The electronic monitor attached to the exercise glider lets you see how many calories you have burned, the duration of the workout, and the number of rows you have completed. It can help you burn up to 800 calories in one hour. The Stamina Body Trac Glider 1050 is an innovative fitness machine that provides an excellent core-building cardiovascular workout right from the comforts of home. With full range-of-motion rowing action, the BodyTrac mimics the feeling and response of an outdoor water exercise. With a comfortable anatomically molded seat, and smooth gliding action along the aluminum center beam, the ball bearing roller resistance challenges and tones up your back, shoulders, abdominals, and chest. High Quality Rowing Simulator at an incredible price! 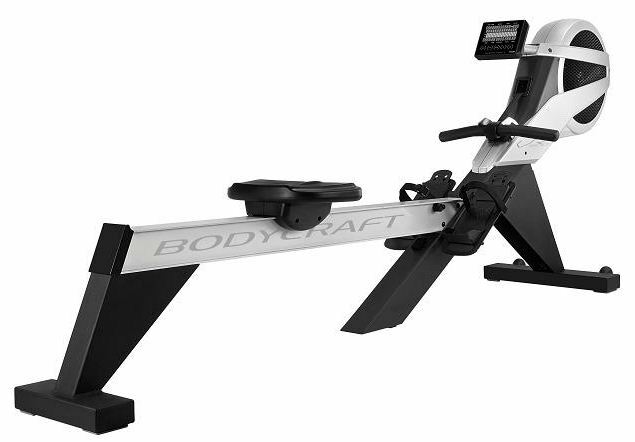 Enjoy a serious upper body, core, and cardio workout with the BodyCraft VR500 / VR100 rowing machine. The VR500 / VR100 is outfitted with a contoured ergonomic seat along with remote handle controls to adjust your resistance. The VR500 / VR100 is so durable it offers a commercial warranty. And when you're done with your workout, the VR500 / VR100 folds up for easy storage. 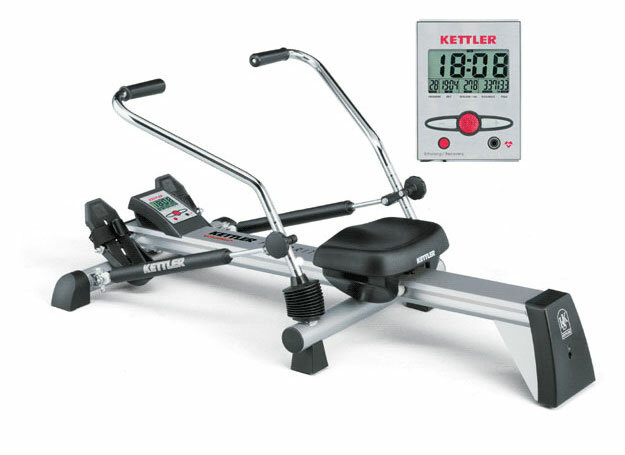 KETTLER rowing machines are great for toning all major muscle groups as well as giving you a cardiovascular workout. 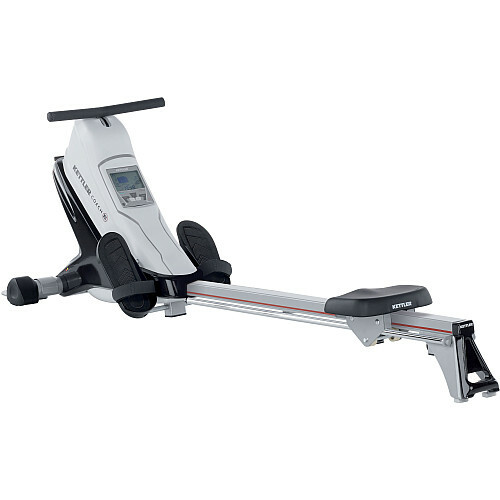 All KETTLER rowing machines feature computers to measure the all-important training data as well as pulse measurement. 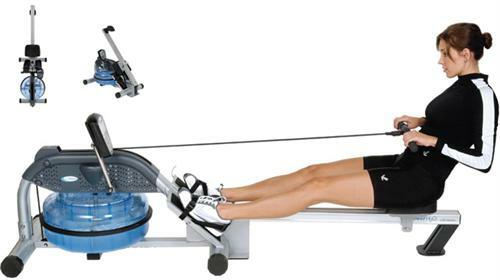 The smooth eddy-current magnetic resistance system of the Coach E rower works on the principal that the amount of energy in the drive stroke is automatically matched with equal resistance. 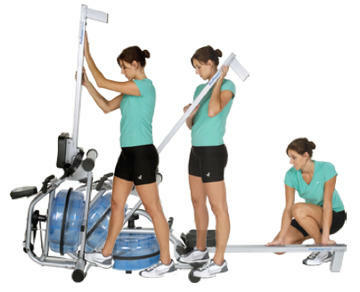 When done working out the Kettler Coach M Rower easily stores in an upright position reducing its footprint thus giving you more room to move about. Two hydraulic cylinders: setting of resistance force between 1 and 12. Comfortable smooth-running seat with rollers mounted on rails. The Kettler Favorit Rower not only improves your stamina and endurance, but also strengthens your back, shoulder, arm and thigh muscles as well. Important exercise data, like number of strokes, stroke frequency and training pulse (with the optional pulse accessory) are shown on the digital display. Medical Professionals and Physical Therapists alike trust the benefits of the WaterRower and Rowing as an excellent cardio exercise. Burning up to 1000 calories per hour and working out up to 84% of your muscle mass during one exercise, rowing offers a tremendously beneficial exercise without the perceived fatigue and exhaustion often apparent when using other cardio training gym equipment. "Rowing on the WaterRower is perhaps the closest experience to actually rowing on water. The resistance created by the paddles is authentic. The rocking motion on the seat with proper technique both replicates the movements on a skull. Rowing is a good way to get cardiac training. It provides a graduated, low impact exercise program with many levels of intensity. Through the use of a monitor, precise levels of effort can be achieved and replicated. The psychological benefits are as important as the physical. The WaterRower provides the kind of satisfying feedback and encouragement that many people find helpful and sustaining. Rowing is a good form of exercise to include in a program of weight reduction as well as as well as in general fitness training. 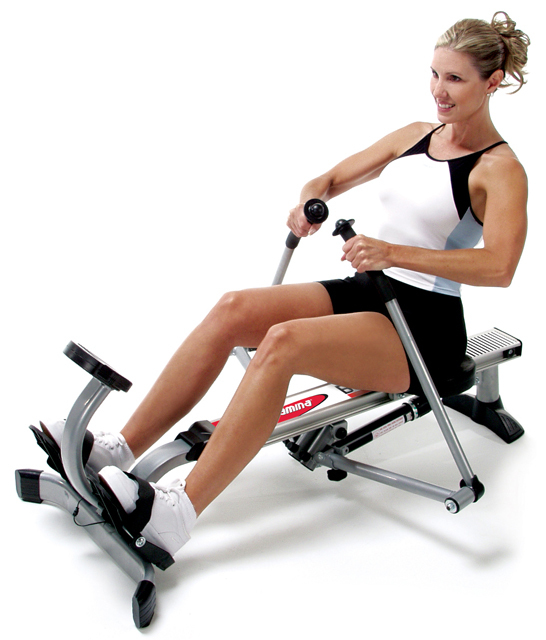 Because of its design, the WaterRower offers many levels of exercise intensity without mechanical adjustments. 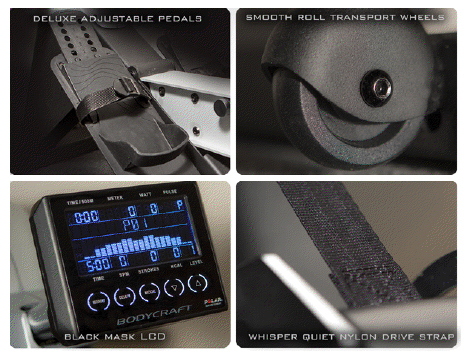 Because of its simplicity, the WaterRower requires virtually no maintenance. Its design and construction are intended to meet commercial standards. 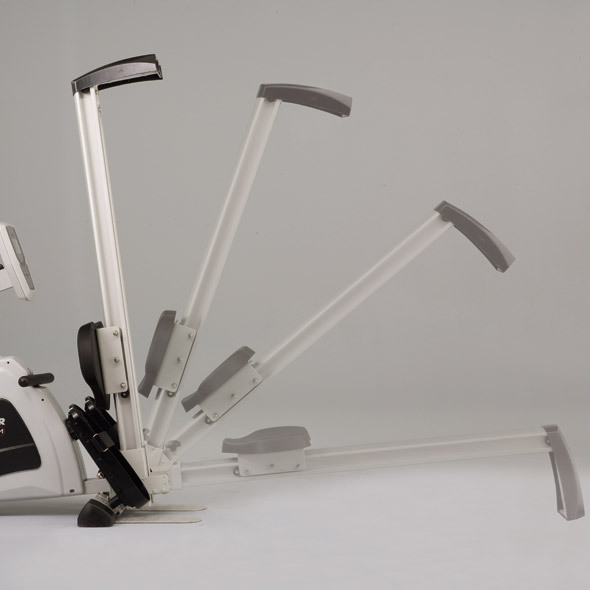 The WaterRower is supported by a number of very good computer-based exercise programs. These software programs offer custom routines, progress tracking, and gratifying feedback. The WaterRower can also be a useful adjunct to a supervised program of physical therapy and cardiovascular rehabilitation. 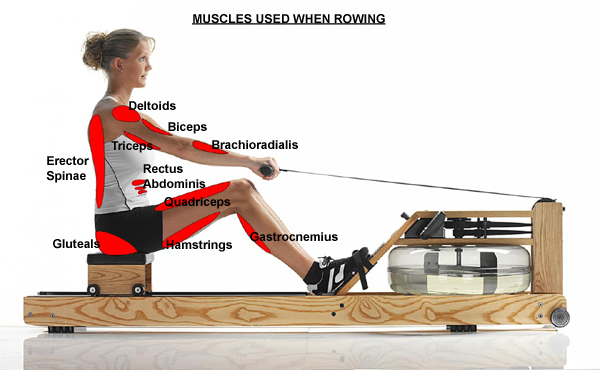 Rowing provides core toning as well as cardiovascular benefits. It stretches and strengthens the flexors and extensors of the upper and lower extremities, and it improves muscle tone, timing, strength, and range of motion. I have recommended the WaterRower to patients who might benefit from rowing as a form of exercise. These benefits include aerobic, impact-free, cardiovascular training, and muscle stretching, toning, strengthening and balance. The WaterRower can provide an accessory to elevate the seating position. This option is helpful for rowers with back or joint pain. I use the WaterRower at home and would recommend it to anyone who is seeking a well balanced training system. If there is one piece of exercise equipment to have in your home, I think the WaterRower is it." 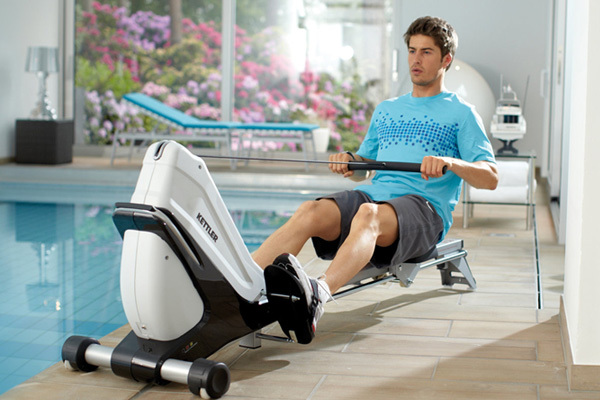 Let the FitnessZone® sales staff help you navigate through the various models of our rowing machines. Our expertly trained staff can assist you in selecting the rowing machine that will custom fit your needs as well as your budget! Call us ANYTIME at 1-800-875-9145.